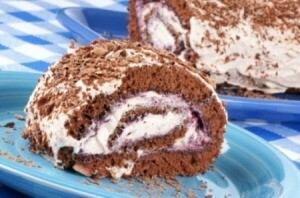 Try making delicious jelly roll style chocolate rolls for the chocolate lovers in your house. This page contains chocolate roll recipes. These make great sweet rolls. The whole family will enjoy these! Mix and refrigerate dough overnight. Roll on floured board into a 12x9 inch rectangle. Frost with 1/2 of the frosting. Foll like jellyroll. Cut in 12 rolls. Put on greased cookie sheet. Bake at 375 degrees F for 15-20 minutes. Frost with remainder of frosting. I love pumpkin rolls but I would like to make a dessert similar to that only using chocolate. Does anyone have a recipe? Here is my recipe and I fill with Ice Cream for X-mas. Beat eggs until thick and lemon colored, beat in sugar. Beat in water and Vanilla on low. Gradually add the remaining 4 ingredients. Bake at 375 on lined & greased Jelly Roll pan 12-15 minutes. Remove right away and roll in powdered sugar towel to cool. Unroll and fill.